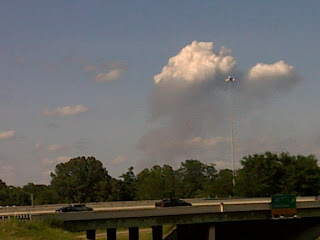 MWN Blog: Pyrocumulus in northern Shelby Co.
A very interesting occurrence took place late this afternoon over northern Shelby County. 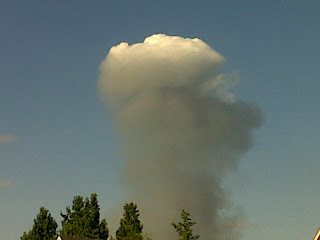 A large fire (of unknown origin) produced enough heat and smoke to create pyrocumulus clouds above the fire. The first picture was taken from many miles away (I-40 and Jackson Ave.) looking north-northeast. The next 3 pictures were taken in sequence over a five-minute period around 5pm from northern Bartlett, looking north-northeast - as the heat first produced the cloud, then near its peak, and finally as it began to dissipate. The cycle repeated itself several times as the fire re-intensified then diminished. 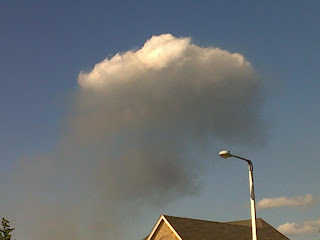 A pyrocumulus cloud is produced by the intense heating of the air from the surface. The intense heat induces convection which causes the air mass to rise to a point of stability, usually in the presence of moisture. 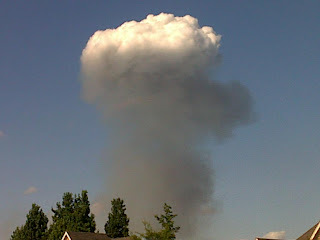 Phenomena such as volcanic eruptions, forest fires, and occasionally industrial activities can induce formation of this cloud. Great pictures, Erik. I've never seen any shots of clouds like this--although I know that there have been extremely rare occasions when fires cause thunderstorms. It's happened in Florida and, more frequently, in Alaska. In Alaska, the fires are huge, producing tremendous heat, and the upper atmosphere is sometimes chilly enough for the contrast of the heat from the fire and the temperatures aloft to cause a convective thunderstorm. Thanks Paul. I'm glad to have a phone with a decent camera always on me! Never know what you'll see. I think this is the first time I've seen pyro-cu too.